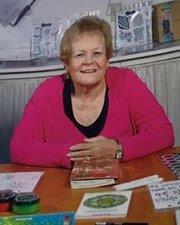 Elizabeth Reil, 72, passed away on Sunday, March 31, 2019, her first Sunday church with Jesus. Elizabeth’s kind and compassionate heart was evident in each endeavor she chose; whether it was at Presbyterian Hospital as an RN, at University Hospital as an RN administrator, or as the owner of Scraps Galore. Elizabeth is survived by her husband, Ken; daughter, Stefani Michaud and her husband, Mike; son, Steve and his wife, Erin; and her grandchildren, Christopher, Brendan, Megan, Kiley, and Natalie. A Celebration of Life service will be held on Friday, May 24, 2019 at 3:00 p.m. at All Saints Lutheran Church, 4800 All Saints Rd NW. In lieu of flowers, the family requests that donations be made to Lap Dog Rescue of New Mexico in honor of Elizabeth’s fur babies. There's still time to send flowers to the Celebration of Life at the All Saints Lutheran Church at 3:00 PM on May 24, 2019.